FOXBORO, Mass. – Coming into Monday night’s opener of the annual Warrior Classic, Foxboro had won twice by more than 50 points, seven times this year by 40 or more points, twice by 30-plus, and four times by 20 or more. All but five games this season had been decided at least double digits (including a 10-point overtime loss to Coyle & Cassidy in the season opener). The Warriors had lost only twice this season, only once in the last 19 games, and completed the program’s first perfect run in the Hockomock League. Foxboro was hoping for a challenge to get them ready for the postseason, although it would be fair to say no one was expecting five-win Hanover to be the team that would provide it. 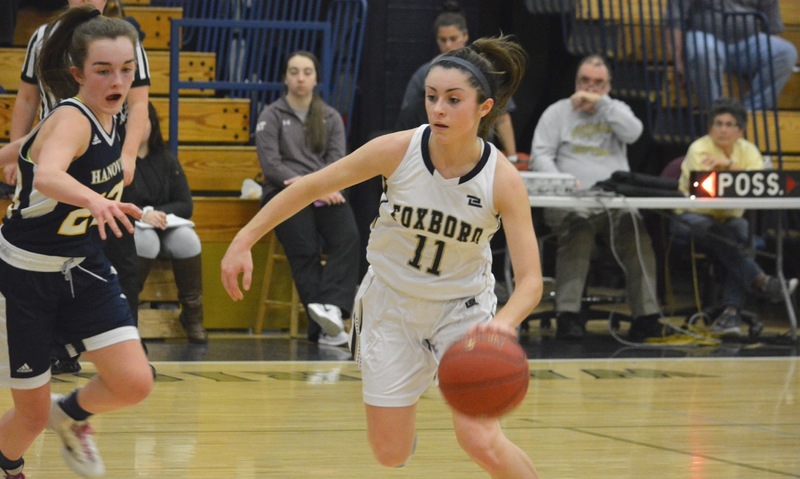 Instead of being another comfortable victory, Foxboro was given all it could handle by the Indians on Monday and needed a season-high 29 points from senior Ashley Sampson, including 13 in the fourth quarter, to pull out a 66-59 victory. From the start, Hanover played like a team that was heading to the playoffs, breaking the Foxboro press and creating easy scoring opportunities at the rim. After a layup by Kathryn Fallon (11 points), Foxboro trailed 11-8 and there were some stunned faces in the stands. Katelyn Mollica (12 points) came off the bench and provided a spark to close out the first quarter, as Foxboro was forced to go small in order to matchup with the Indians. She drove baseline for a layup and then scored in transition after one of Sampson’s four steals. Lily Sykes (six points) drilled a three to put the Warriors up four but a three-point play by Clare Connolly cut the lead to 15-14 after one. The Indians continued to play well into the second, taking a 20-16 lead, before Foxboro finally put together one of its trademark runs. The Warriors scored the next 14 points to lead by double digits for the first time. Half of those points came from the line, including five free throws from Sampson, who scored seven of Foxboro’s 14 points during the run. Mollica also knocked down a three after a Grace Tamulionis offensive rebound and kick-out pass. Tamulionis finished with seven points, eight boards and six assists. Leading 32-24 at the break, Foxboro came out for the third quarter trying to get the ball into the paint, where the Warriors had a distinct size advantage. Sampson posted up first and drew a foul and then Shannon Smally (eight points) got the ball several times in the post, scoring six points in the third. Hanover never caved and continued to cut into the Foxboro lead. Erin Flynn (10 points) scored five straight and Janey Devlin scored seven of her 19 points in the third. The Indians were controlling the glass, getting two and sometimes three looks at the basket. The came continued to be tight throughout the fourth quarter, a rarity for the Warriors this season. A Flynn three pulled the Indians within one at 52-51 and after Sampson got to the basket with a baseline drive, Devlin answered with a put-back. Sampson started to take over down the stretch, as the Warriors got the ball into the Adelphi University-commit’s hands on every possession. She got a finish at the rim off a Tamulionis assist and then knocked down a step-back jumper on the baseline. Mollica added an almost identical jumper and Sampson made 4-of-5 from the line to close things out. It was a scare, but maybe it was a scare that the Warriors needed at this point in the season. “We find out how they’re going to do with a little more pressure, a little more chaos on the floor than they’re used to and then we see how they react and what we have to work on in the next week,” Downs remarked. Foxboro (19-2, 16-0) will face Natick in the final of the Warrior Classic on Tuesday. Natick rolled past Hoosac Valley by 30 points on Monday.